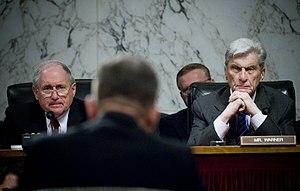 Chairman Carl Levin (D-MI) and former Chairman John Warner (R-VA) listen to Admiral Mike Mullen's confirmation hearing before the Armed Services Committee to become Chairman of the Joint Chiefs of Staff in July 2007. The Armed Services Committee is the prime scene of discussion regarding U.S. military in the Senate. In June 2009, Armed Services Committee senators Joe Lieberman, Carl Levin (chair), and John McCain, listen to Secretary of the Navy Ray Mabus deliver his opening remarks for the fiscal year 2010 budget request in June 2009. 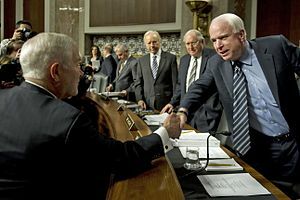 Hearing regarding "Don't Ask, Don't Tell," U.S. Secretary of Defense Robert M. Gates greets Ranking member, John McCain. December 2, 2010. 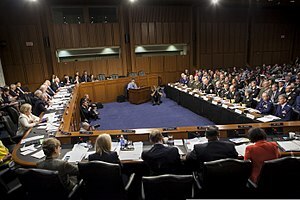 The Committee on Armed Services (sometimes abbreviated SASC for Senate Armed Services Committee on its Web site) is a committee of the United States Senate empowered with legislative oversight of the nation’s military, including the Department of Defense, military research and development, nuclear energy (as pertaining to national security), benefits for members of the military, the Selective Service System and other matters related to defense policy. The Armed Services Committee was created as a result of the Legislative Reorganization Act of 1946 following U.S. victory in the Second World War. It merged the responsibilities of the Committee on Naval Affairs (established in 1816) and the Committee on Military Affairs (also established in 1816). Considered one of the most powerful Senate committees, its broad mandate allowed it to report some of the most extensive and revolutionary legislation during the Cold War years, including the National Security Act of 1947. The committee tends to take a more bipartisan approach than other committees, as many of its members formerly served in the military or have major defense interests located in the states they come from. Aeronautical and space activities pertaining to or primarily associated with the development of weapons systems or military operations. Department of Defense, the Department of the Army, the Department of the Navy, and the Department of the Air Force, generally. Maintenance and operation of the Panama Canal, including administration, sanitation, and government of the Canal Zone. National security aspects of nuclear energy. Naval petroleum reserves, except those in Alaska. Pay, promotion, retirement, and other benefits and privileges of members of the Armed Forces, including overseas education of civilian and military dependents. Strategic and critical materials necessary for the common defense. ^ Steinhauer, Jennifer. "With Chairmanship, McCain Seizes Chance to Reshape Pentagon Agenda", The New York Times (June 9, 2015). Retrieved June 10, 2015. ^ Rule XXV: Committees, Standing Rules of the United States Senate. ^ a b Angus King is an independent, but caucuses with the Democrats. ^ "U.S. Senate: Committee on Armed Services". Senate.gov. Retrieved January 7, 2017. ^ a b c Sens. Lieberman and King were elected as Independents, but caucused with Democrats on the committee. Wikimedia Commons has media related to United States Senate Armed Services Committee. Senate Armed Services Committee Report on Torture released November 20, 2008.